University of Washington Department of Electrical Engineering (UW EE) senior Vijay Singh has been chosen as a 2017-2018 IEEE Power & Energy Society Scholar. 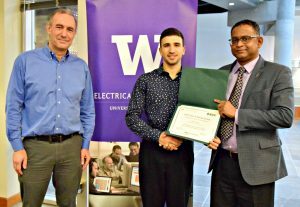 This prestigious award is presented to the highest-achieving electrical engineering students, with a focus in the power and energy sector, across the U.S.
Singh will graduate with his BSEE from UW EE in winter quarter 2018. Afterwards, he will be attending the university with his master’s in electrical engineering. For Singh, the award serves as a recognition of his efforts, and it lends to the importance of faculty mentorship.